In a world full of plastics, paint and fiberglass it can be difficult to be a person with a passion for the truly authentic. But there is something so connecting about real wood, hard stone, veined leaf and soft petal that makes the pursuit worth the trouble. Exposure to the real elements of natural life create a meaningful connection that keeps you grounded to your reality … which is one of the reasons essential oils are so valuable physically, emotionally and spiritually. But I was surprised to discover, a few years back, that one of the essential oils I’ve long known and loved was actually a complete imposter (of sorts). It’s wintergreen. I’d always grouped this sweet and mentholated scent in my brain along with mints such as the powerful peppermint. Then I found out the truth – this muscle-soothing and pain-reducing tool is NOT ACTUALLY A MINT AT ALL! It’s not wintergreen’s fault, though, It’s mine. I’ve enjoyed the deep sweetness of this plant as a flavor addition to gum and candy … but it wasn’t until I began researching the source of the powerful natural constituents in certified organic wintergreen essential oil that I learned that the oil is actually sourced from the leaves of an evergreen shrub. Wintergreen has been used for centuries by tribes native to North America to help boost energy, tone the respiratory system and ease congested breathing. It is a natural antioxidant, produces feelings of energy and has immune-enhancing potential since it lowers inflammation and reduces pain. The leaves of the wintergreen shrub in the wild are actually without taste or smell. But when the constituents in the leaves break down with heat, they take on a deep mentholated sweetness that rivals spearmint for its strength and aromatherapy satisfaction. 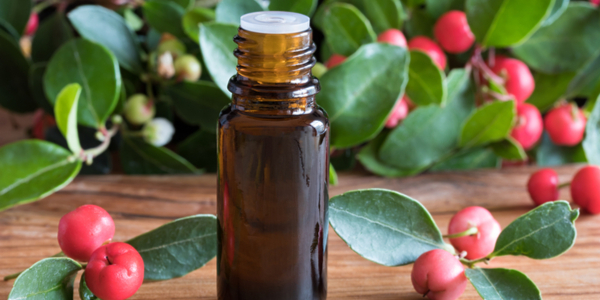 Our certified organic wintergreen essential oil contains the active ingredient methyl salicylate, which makes up about 85 percent to 99 percent of the final essential oil. The potency and characteristics of organic wintergreen are too much for kids … keep it out of their reach and avoid exposure. But for healthy adults, this sweet and potent mint-like essential oil is the real deal … even if it isn’t the deal I expected.